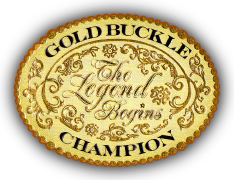 Gold Buckle Champions… to further the education of equine health and safety, while preserving our western heritage and history, by means of promoting equine events incorporating the youth and community. Demanding excellence within ourselves while helping to ensure the longevity of equine events through school assemblies, educational clinics, and community projects. Encouraging everyone to find the champion within themselves. Our program “Legends in the Making” rewards school age children who participate in community programs to learn life skills; public speaking, resume writing, balancing a checkbook, and other skills necessary to be productive individuals. They are also encouraged to make a difference in their community by solving problems, such as; coat and can food drives, Toys for Tots, and first responders help funds for people in desperate need. They are awarded points for all their achievements and activities, which they can use at the end of the year at an auction to buy scholarships, sports equipment for teams, trips to national conventions for groups, and other productive items. We provide empowerment assemblies at schools and introduce the children to other youth ambassadors who have overcome odds to become successful and have achieved their goals against all odds. It is noted that children involved in equine and agricultural activities and lifestyles are family oriented, more apt to go on to higher education, and are seldom ever involved in drugs and crime. We are shining a light on these examples to encourage other children to follow in their footsteps. Finding opportunities for children to experience first-hand what it is like to solve your own problems and make a difference in their own communities is our goal.